We recommend using IMAP instead of POP for accessing your incoming email. Pop configurations will often delete mail from the server, making it unavailable to other devices or computers you would use to access your email. With IMAP, you can access your mail using your computer and smartphone, and keep mail syncronized between devices. Important note: In the description below, we use you@yourdomain.com and yourdomain.com as your email address and domain name. You need to substitute of course your real email address and domain name. About Secure Sockets Layer (SSL): In the instructions below, we are not enabling SSL. If you wish to connect to the incoming IMAP and outgoing SMTP server using encryption, then leave these enabled. 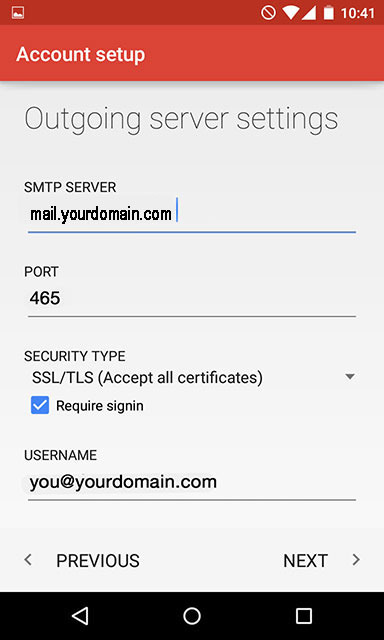 There will not be an SSL certificate on the server to match mail.yourdomain.com or imap.yourdomain.com, so your mail program will warn you that you are connecting without a certificate. Confirm the exception when this happens. On the next screen you will choose to configure an IMAP account. 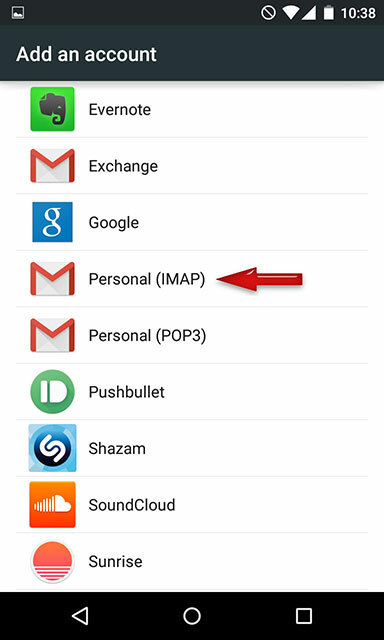 Tap Personal (IMAP). 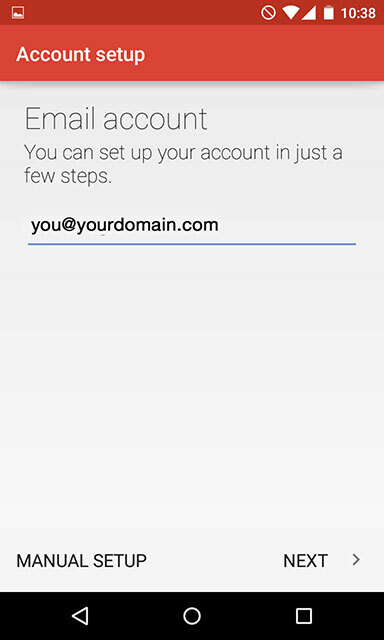 The Account Setup screen will prompt you to enter your email address. Type in your full email address and tap NEXT. 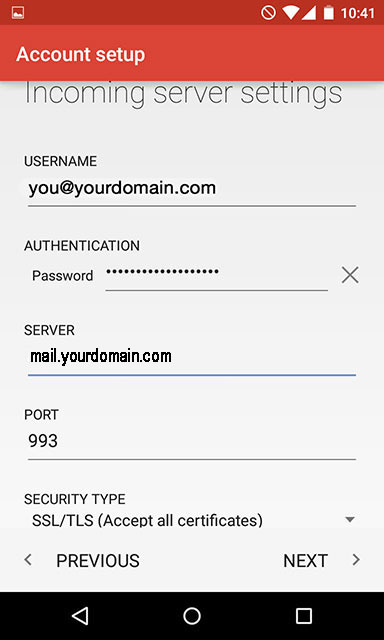 On the Incoming Server Settings, enter in your email address and password. Under Server, enter in your server name, and port 993. Security type is SSL/TLS. Tap NEXT. On the Outgoing server settings page, again enter in your server's name, port 465, security type of SSL/TLS, and check the box Require singin. Under username, enter in your email address and tap NEXT. 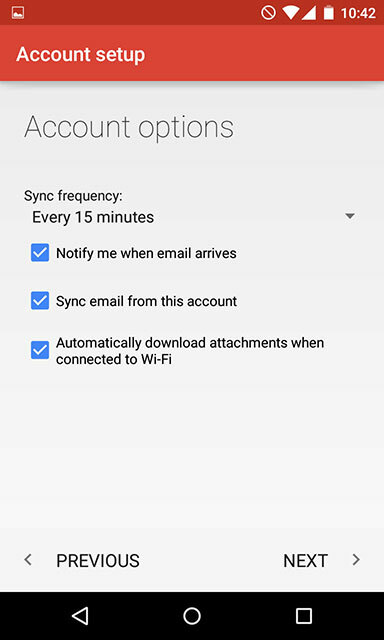 You can tailor how often you want your device to check for new mail. You can give your account configuration name, and enter in your name to be displayed. Tap NEXT to complete your setup. 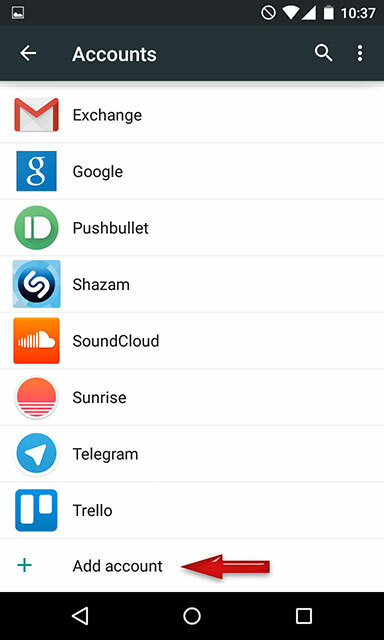 This page was last modified on 6 March 2018, at 15:01.